The technicians at Hendersonville Muffler Company are aware that Hendersonville, Tennessee has temperatures that range from less than 0° to more than 110°. They also realize that with this wide range of temperatures we must keep our customers cooling systems in very good condition for the varying temperatures here in Hendersonville, Tennessee. A small failure in the cooling system can create a very large repair job for the engine. Cooling systems that don’t work correctly can also cause the heating system of the car not to work correctly as well . In the winter time with the low temperatures that we have here in Sumner County, Tennessee customers notice problems with their heaters and heating systems VERY quickly. Automobile engines are internal cumbustion engines. This means that the inside of the cylinders normally operate at temperatures of about 1200°. Though this heat is mostly dispursed out of the exhaust valves and through the exhaust system the cooling system is absolutely critical to keeping the engine from getting destroyed. To move the engine coolant through the cylnder block and cylinder heads devices called water pumps are used. 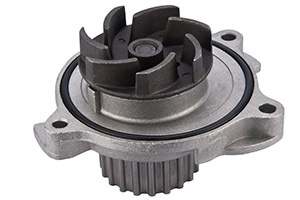 The water pump spins at approximately half the engine speed in most engines and forces the coolant to travel through the engine, past a coolant thermostat, and through the radiator where a radiator fan cools the engine coolant temperature back down to approximately 195°. 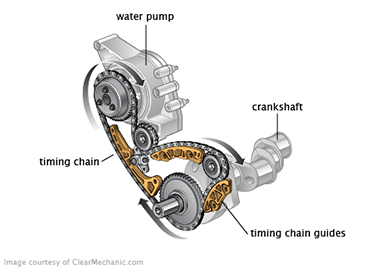 Though most water pumps are driven by the serpentine belt many are driven by the timing belt such as the one shown above but many are driven by the timing chain such as the one on the left here. The technicians here at Hendersonville Muffler Company have been repairing cooling systems on cars and trucks since the first day that we opened. We are the best place in Hendersonville to have your water pump diagnosed, repaired, or replaced. We are also the best place to have your radiator repaired or replaced, take care of any leaking coolant hoses, heater cores, heater valves, electric fans, coolant level and coolant strength, PCM management systems or anything else that can go wrong with car and truck cooling systems in Hendersonville, Tennessee. As cars and trucks have become more complex the PCM, (computer) has become more involved with cooling systems. Most cars and trucks have at least one electric fan and the computer decides when the fans turn on or off. Most electric fans don’t come on at all in the winter unless the car sits in one spot for a long time. As Summer approaches it's a good idea to have a free cooling systems check from Hendersonville Muffler Company. You read that correctly. most initial inspections including cooling system inspections are free from Hendersonville Muffler Company. You’ll be a lot better off if you just have your cooling system inspected by the technicians at Hendersonville Muffler Company. Our trained mechanics can spot small problems with your car BEFORE they turn into major repairs. We have the latest diagnostic equipment including the largest collection of cooling system pressure test adaptors in Hendersonville, Tennessee and Thermal imaging cameras to show our customers the deficencies in clogged radiators. We have the experience to tell you exactly what your cooling system problem is instead of just replacing parts to see if that fixes the problem. 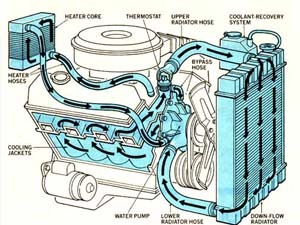 We can provide you with the best service and reasonably priced parts for your cooling system repairs in Hendersonville.